WIN #26: Annabel Karmel 6 Piece Mini Cupcake Set From Casdon PLUS Cake Mixes! Win a Annabel Karmel Mini Cupcake Set from Casdon, and two cupcake mixes! If your crafty little cook loves to be a mum's kitchen helper, you'll love Annabel Karmel's brand new cooking range from Casdon! From Mini Cupcake Sets to Pizza Baking Sets, there's something for all children from the new range launched in July this year. Casdon has been renowned for toy innovation for over 65 years and has an unrivalled reputation as a developer of toy replicas, with some of the most prestigious domestic appliance products on the market. 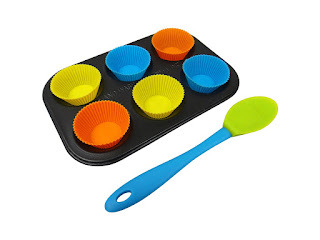 In vibrant colours, made just right for small hands, this baking set is just one of the Annabel Karmel baking kits from Casdon, suitable for little bakers aged 5-11 years who would love to improve their cooking skills! One lucky reader/visitor of Unique Young Mum will not only win the Annabel Karmel mini cupcake set, but also two lots of children's character cupcake mixes (Frozen and Star Wars ). To find out more about Casdon and to view their full range of toys, check out the official website here.